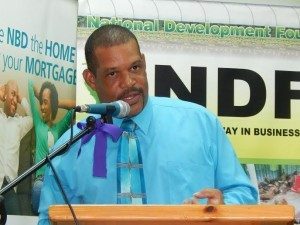 Executive Director of the National Development Foundation of Dominica Cletus Joseph says the foundation recorded XCD$ 2.3 million dollars in revenue for the year 2016. Joseph was speaking at NDFD’s 35th Annual General Meeting at the Prevost Cinemall on Wednesday. However, Joseph called clients to fulfill their financial obligations to the foundation. The meeting was held under the theme: “NDFD – The vehicle to MSME Development”. Meantime, Joseph says the foundation recorded assets of XCD$20.5 million dollars by the end of 2016.